Leach S.B., Fine D.M., Schutrumpf R.J. 3rd, Britt L.G., Durham H.E., Christiansen K. Coil embolization of an aorticopulmonary fistula in a dog // J Vet Cardiol. 2010 Dec;12(3):211-6. An 8-year-old, castrated male Basset Hound was evaluated for congestive heart failure and atrial fibrillation. Echocardiography and angiography demonstrated a left-to-right shunting aorticopulmonary fistula. Coil embolization of the fistula was initially successful in reducing the volume of blood flow through the vascular network. The dog was medically managed for congestive heart failure until it was euthanized 6 months after initial presentation. The physiology and treatment of centrally located arteriovenous fistulae are discussed. An 8-year-old, castrated male Basset Hound was presented to his referring cardiologist for coughing and tachypnea of 2 days duration, and exercise intolerance of several months duration. A heart murmur of unknown intensity was first heard 6 months prior on a routine wellness examination. Thoracic radiographs showed generalized enlargement of the cardiac silhouette and prominent left atrial enlargement along with mild pleural effusion, diffuse interstitial infiltrates, and pulmonary arterial and venous distension, consistent with congestive heart failure. Echocardiography revealed a continuous left-to-right shunting defect that was best visualized from the left side of the thorax in a location reported to be atypical for a patent ductus arteriosus. An ECG revealed atrial fibrillation with a heart rate of 220 bpm. Therapy with furosemide (3 mg/kg PO q 12 h), enalapril (0.5 mg/kg PO q 12 h), diltiazem (1 mg/kg PO q 8 h), pimobendanc (0.25 mg/kg PO q 12 h), and digoxin (0.0047 mg/kg PO q 12 h) was initiated. The dog was subsequently referred to the University of Missouri Veterinary Medical Teaching Hospital (VMTH) for further evaluation. On presentation to the VMTH the dog was lethargic, depressed, and no improvement in clinical signs was reported with therapy. Physical examination revealed an irregularly irregular heart rhythm with a rate of approximately 200 bpm with femoral arterial pulse deficits and variable pulse quality. A grade IV/VI left apical systolic heart murmur was ausculted. The respiratory rate was 50 breaths/minute and increased bronchovesicular sounds were detected diffusely. Thoracic radiographs were repeated and demonstrated signs of persistent heart failure including left atrial enlargement, pulmonary arterial and venous distension, and diffuse interstitial infiltrates. The cardiac silhouette was enlarged with a vertebral heart score of 13.25 (reference range 8.5—10.6).1 Systolic blood pressure measured 100 mm Hg using Doppler methodology. An ECG documented atrial fibrillation with a ventricular response rate of 200 bpm. A serum biochemistry panel showed a mild increase in blood urea nitrogen (33 mg/dL; reference range, 8—28 mg/dL) and alkaline phosphatase (139 U/L; reference range, 9—58 U/L). Diltiazem was discontinued due to evidence of systolic dysfunction reported on the previous echocardiogram. The dog was hospitalized and given furosemide (2 mg/kg IV q 6 h) and 3 doses of digoxin (0.002 mg/kg, IV, q 3 h). Following intravenous digoxin therapy, the heart rate was maintained at 150—180 bpm overnight. The following day, echocardiography showed severe left atrial dilation (5.24 cm; reference range, 2.0—	2.6 cm), severe left ventricular chamber dilation in diastole (6.17 cm; reference range 4.1—	4.7 cm) and systole (4.15 cm; reference range 2.6—3.2 cm). Severe mitral regurgitation and mild tricuspid regurgitation were seen on color Doppler. Continuous-wave Doppler interrogation of the tricuspid regurgitation revealed no evidence of pulmonary hypertension. A long, tortuous vascular structure was seen in an oblique left cranial view, with the probe positioned at the mid-thorax. There was continuous low-velocity flow through the structure demonstrated on continuous-wave Doppler (Fig. 1A—C). Peak velocity through the structure measured 2.42 m/s. The patient was anesthetized and a 6 Fr vascular access sheathd was placed in the right femoral artery and a 5 Fr pigtail angiographic cathetere was advanced to the level of the aortic root with the assistance of a 0.035”, 150 cm flexible guide wiree. Selective aortography was performed by injecting contrast mediumf (1.5 mL/kg IV) utilizing an automated injector at a rate of 13 mL/s for 3 s. A left-to-right shunting vascular fistula was noted coursing from the descending aorta and terminating into a plexus of smaller vessels, which entered the main pulmonary artery (Fig. 2A—C and Video 1). 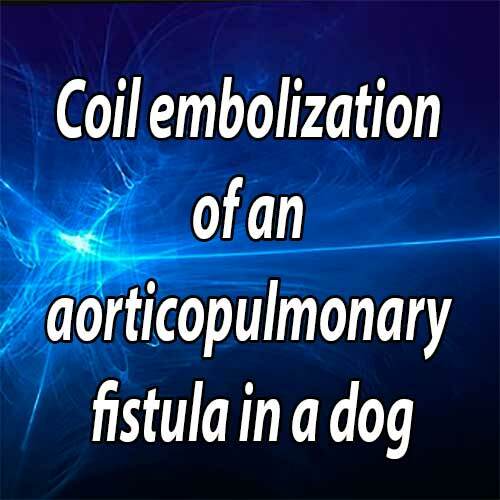 Given the unknown cause of the aorticopulmonary fistula, the dog was recovered without attempting to occlude the vessel. The dog was discharged on furosemide (2.3 mg/kg PO q 12 h), enalapril (0.5 mg/kg PO q 12 h), digoxin (0.007 mg/kg PO q 12 h), and pimobendan (0.25 mg/kg PO q 12 h). The dog returned 3 weeks later for further evaluation and attempted occlusion of the fistula. Abdominal radiographic and ultrasonographic examinations were normal. The dog was anesthetized and computed tomography of the thorax was performed to determine if the fistula was the result of neoplastic neovascularization. No mass or other abnormalities were visualized. Since no discernable cause for the aorticopulmonary fistula was seen, we attempted coil occlusion. A 7 Fr vascular access sheath was placed into the right jugular vein and a 6 Fr angiographic catheterg was passed to the level of the pulmonic valve and an angiogram was performed. The pulmonary vasculature was normal. A 6 Fr vascular access sheath was placed into the right carotid artery and a 5 Fr pigtail angiographic catheter was advanced into the descending aorta and selective aortography was performed to delineate the anatomy of the fistula. A 5 Fr vertebral curve catheterh was passed into the aorticopulmonary fistula with the assistance of a guide wire. Eight embolization coils' of varying diameters were sequentially deployed into the lumen of the fistula using 3 Fr 115 cm biopsy forcepsj. Repeat angiography demonstrated a substantial decrease in the volume of shunting through the fistula, although smaller patent aberrant vessels were now more apparent (Fig. 2D and Video 2). Placement of an additional coil was attempted, but it could not be secured within the coil mass as there was excessive motion of the free end of the coil, suggesting an increased likelihood of aortic embolization. Arrow indicates a vascular connection to the pulmonary artery. (B) Same view as A, with color Doppler overlay. (C) Low velocity continuous flow through the fistula demonstrated with continuous-wave Doppler. Ao, aorta; MPA, main pulmonary artery. Invasive dorsal pedal arterial blood pressures were recorded during the catheterization procedure following the computed tomography of the thorax. Initial blood pressures ranged from 80 to 100 mm Hg systolic, 58—76 mm Hg mean, and 42—60 mm Hg diastolic. A dobutamine constant rate infusion was initiated and the pressures rose to a range of 110—130 mm Hg systolic, 70—80 mm Hg mean, and 50—60 mm Hg diastolic. No changes in blood pressures were noted following partial coil occlusion of the fistula. The dog recovered uneventfully from anesthesia and a repeat echocardiogram was performed the following day. Although there was no change in cardiac dimensions, the flow velocity through the fistula had decreased to 1.5 m/s on continuous- wave Doppler. The dog was discharged on the i previously prescribed cardiac medications and cephalexin (20 mg/kg PO q 12 h for 14 days). A recheck examination was performed at 3 months. The owners reported that the dog still had a decreased appetite but had otherwise returned to normal. On physical examination the dog was tachypneic (64 breaths/min) but not dyspneic. The heart rhythm was irregularly irregular with a rate of 144—170 bpm, consistent with the previous diagnosis of atrial fibrillation. The heart murmur was unchanged in intensity or quality from previous evaluations. An echocardiogram showed no changes in the cardiac dimensions; however, the continuous low-velocity flow across the fistula had increased back to pre-occlusion values. Radiographs showed enlargement of the cardiac silhouette with a vertebral heart score of 14, but no evidence of congestive heart failure. The serum digoxin concentration for a 2-h post-pill sample was 2.44 ng/mL (therapeutic range, 0.8—2.2 ng/mL). The dose of digoxin was reduced to 0.005 mg/kg PO q 12 h, which resulted in an improvement in the dog’s appetite. Serum digoxin concentrations were repeated 2 weeks later and were 1.4 ng/mL measured 6 h post-pill. The dog presented 5 months after the initial visit for coughing and inappetence. The owners reported that his resting respiratory rate had been normal at home. Thoracic radiographs revealed no evidence of congestive heart failure; however, severe left mainstem bronchial compression was evident. Echocardiography revealed an increase in the left atrial size in comparison to the previous study (6.85 cm; reference range, 2.0—2.6 cm). The dog was discharged with hydrocodone (0.22 mg/kg PO q 8—12 h), and the owner subsequently reported a decrease in the frequency of coughing episodes at home. Approximately 6 months after initial visit the dog was presented to an emergency clinic for acute onset of dyspnea and tachypnea, and was subsequently euthanized. No necropsy was performed. (C) Same view as A and B, demonstrating the large complex vascular network associated with the aorticopulmonary shunt. (D) Right lateral angiogram of the descending aorta after deployment of several embolization coils (arrowheads), demonstrating reduced volume of flow through the aorticopulmonary fistula. Arteriovenous (AV) fistulae are uncommonly reported in veterinary medicine.2-10 Most AV fistulae involve the peripheral vasculature in the extremities and are usually secondary to trauma.3-7 Centrally located AV fistulae occur less frequently, usually affecting the great vessels and cardiac chambers.7 In humans, aorticopulmonary fistulae are most commonly acquired secondary to thoracic surgery or trauma or as a sequela to disease processes that cause substantial stress and distension on the aortic wall including atherosclerosis, mycotic infections, and bacterial endocarditis.11-13 Less commonly, aorticopulmonary fistulae have been reported as congenital malformations in dogs and humans.8,14 Coronary artery to right atrial fistula and aortic to left atrial fistula secondary to bacterial endocarditis have been reported in dogs.9,10 The underlying cause for fistula formation in the case presented here could not be determined. There was no history of trauma, pulmonary disease, or travel beyond the state of Missouri. However, it appears likely that the defect was acquired rather than congenital as a murmur was first ausculted only 6 months before presentation. Buchanan JW, Bucheler J. Vertebral scale system to measure canine heart size in radiographs. J Am Vet Med Assoc 1995;206:194-199. Abbott JA, Porzio P. Rupture of the left aortic sinus into the pulmonary artery in a dalmation dog. Vet Radiol Ultrasound 1998;39:544-550. Saunders AB, Fabrick C, Achen SE, Miller MW. Coil embolization of a congenital arteriovenous fistula of the saphenous artery in a dog. J Vet Intern Med 2009;23:662-664. Jones DG, Allen WE, Webbon PM. Arteriovenous fistula in the metatarsal pad of a dog: a case report. J Small Anim Pract 1981;22:635-639. Santoro D, Pease A, Linder KE, Olivry T. Post-traumatic peripheral arteriovenous fistula manifesting as digital haemorrhages in a cat: diagnosis with contrast-enhanced 3D CT imaging. Vet Dermatol 2009;20:206-213. Aiken SW, Jakovljevic S, Lantz GC, Blevins WE. Acquired arteriovenous fistula secondary to castration in a dog. J Am Vet Med Assoc 1993;202:965-967. Fox PR, Petrie JP, Hohenhaus AE. Peripheral vascular disease. In: Ettinger SJ, Feldman EC, editors. Textbook of veterinary internal medicine. Philadelphia: WB Saunders; 2005. p. 1145-1165. Jacobs GJ, Calvert CA, Hall DG, Kraus M. Diagnosis of right coronary artery to right atrial fistula in a dog using twodimensional echocardiography. J Small Anim Pract 1996;37: 387-390. Smith A, Finn-Bodner S, Dillon A. Left ventricular outflow tract to left atrial fistula associated with endocarditis in a dog. J Am Anim Hosp Assoc 2000;36:133-136. Panday S, Hishikar A, Karbhase J. Rupture of syphilitic aneurysm of ascending aorta into main pulmonary artery: successful emergency repair. J Thorac Cardiovasc Surg 1982;83:470-471. Endara A, Corkeron MA, Diqer AM, Neal AJ, Kang D. Pneumococcal aortic valve endocarditis causing aortopulmonary artery fistula. Ann Thorac Surg 2001;72:1737-1738. Orhan O, Osman K, Yahya P, Serter G, Sevim K. Congenital aortopulmonary fistule: multislice CT angiography findings. Eur J Radiol Extra 2009;71:e41-e42. Heath D, Donald DE, Edwards JE. 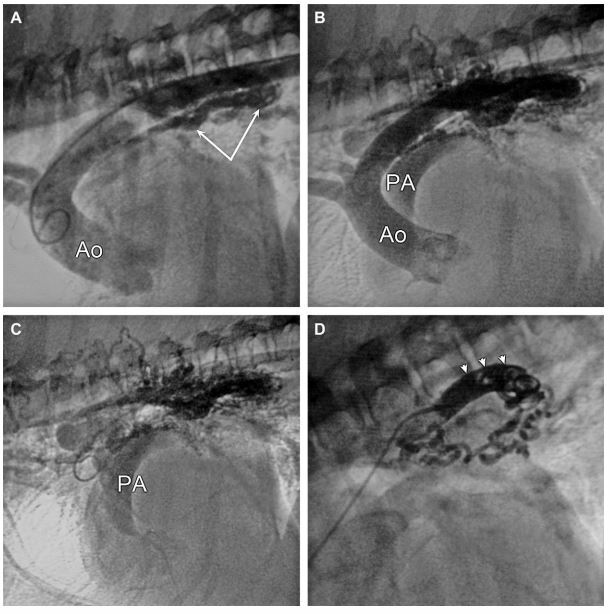 Pulmonary vascular changes in a dog after aortopulmonary anastomosis for four years. Br Heart J 1959;21:187-196. Tobias KM, Cambridge A, Gavin P. Cyanoacrylate occlusion and resection of an arteriovenous fistula in a cat. J Am Vet Med Assoc 2001;219:785-788. Lee BB, Do YS, Yakes W, Kim DI, Mattassi R, Hyon WS. Management of arteriovenous malformations: a multidisciplinary approach. J Vasc Surg 2004;39:590-600. Gossage JR, Kanj G. Pulmonary arteriovenous malformations. A state of the art review. Am J Respir Crit Care Med 1998;158:643-661. Andersen PE, Kjeldsen AD. Long-term follow-up after embolization of pulmonary arteriovenous malformations with detachable silicone balloons. Cardiovasc Intervent Radiol 2008;31:569-574. Remy-Jardin M, Dumont P, Brillet PY, Dupuis P, Duhamel A, Remy J. Pulmonary arteriovenous malformations treated with embolotherapy: helical CT evaluation of long-term effectiveness after 2-21-year follow-up. Radiology 2006; 239:576-585. MagerJJ, OvertoomTT, BlauwH, LammersJW, WestermannCJ. Embolotherapy of pulmonary arteriovenous malformations: long-term results in 112 patients. J Vasc I nterv Radiol 2004;15: 451-456. Riesenman PJ, Brooks JD, FarberMA. Thoracic endovascular aortic repair of aortobronchial fistulas. J Vasc Surg 2009;50: 992-998.